We see a variety of plants existing around us. Plants with green and tender stems are called herbs. They are usually short & may not have many branches. These plants have the stem branching out near the base. The stem is hard but not very thick. The stems have branches in the upper part, much above the ground. Conducts water from roots to the leaves (and other parts) and food from leaves to other parts of the plant. The stem bears leaves, flowers and fruits. The part of a leaf by which it is attached to the stem is called petiole. The broad, green part of the leaf is called lamina. The lines on the leaf are called veins. There is a thick vein in the middle of a Leaf. It is called midrib. The design made by veins in a leaf is called the leaf venation. If this design is net-like on both sides of midrib, the venation is reticulate. In the leaves of grass the veins are parallel to one another. This is parallel venation. Water comes out of leaves in the form of vapour by a process called transpiration. Plants release a lot of water into the air through this process. Leaves prepare their food in the presence of sunlight and a green coloured substance present in them. For this, they use water and carbon dioxide from air. This process is called photosynthesis. Oxygen is given out in this process. The food prepared by leaves ultimately gets stored in different parts of plant as starch. Helps in absorption of water and inorganic nutrients. Helps in holding the plant firmly in the soil. They are said to anchor the plant to the soil. In 1st Fig. The main root is called tap root and the smaller roots are called lateral roots. In 2nd Fig. Plant do not have any main root. 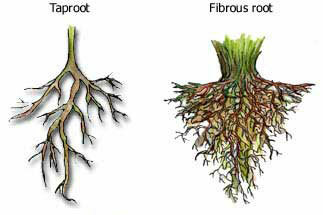 All roots seem similar and these are called fibrous roots. Leaf venation and the type of roots in a plant are related. Plants having leaves with reticulate venation have tap roots while plants having leaves with parallel venation have fibrous roots. 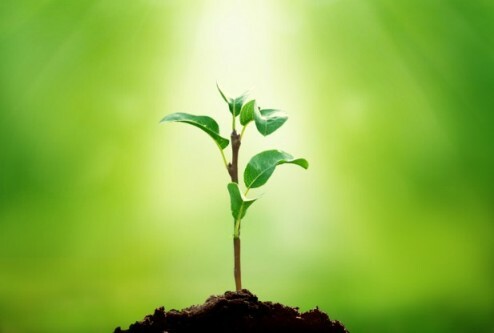 Roots absorb water and minerals from the soil and the stem conducts these to leaves and other parts of the plant. The leaves prepare food. This food travels through the stem and is stored in different parts of a plant. We eat some of these as roots— like carrot, radish, sweet potato, turnip and tapioca. We also eat many other parts of a plant where the food is stored. Prominent parts of the open flower are the petals of the flower. often as support for the petals when in bloom. It is the lowermost and swollen part of the pistil. Small bead like structures inside the ovary are called ovules.